The SOM-10N Flow Wrapper System is manufactured by GGA Packaging. The SOM-10 Servo Flow Wrap Machine provides high throughput, precision packaging with multi-axis servo control, bi-directional registration correction, servo-controlled crimp seal, and out-of-position no crimp. Touchscreen control with 100 retrievable recipes, and network connectivity provide easy operation. On-screen PM flag and monitor, electronic line supervision, and rugged, modular construction provide ease of maintenance. 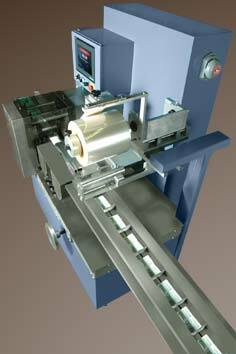 The SOM-10 features make the system ideal for a wide range of wrapping applications in many industries. All models are UL approved and have optional CE certification.